In most patients, the diagnosis of a massive rotator cuff tear can be made based solely on the history and physical exam. To determine adequate treatment options, the clinician must determine if the patient’s chief complaint is pain, weakness, or a combination of both. On physical exam, it is important to determine if the patient is able to elevate their arm above horizontal. If they cannot elevate, an injection of local anesthetic may be beneficial to determine if there is pain inhibition accounting for the patient’s weakness. Comfort with specific rotator cuff muscle strength testing and identifying an external rotation lag are essential in making a diagnosis and developing a treatment plan. This comfort is gained with experience. Titchener AG, White JJ, Hinchliffe SR, Tambe AA, Hubbard RB, Clark D. Comorbidities in rotator cuff disease: a case-control study. J Shoulder Elbow Surg. 2014;23(9):1282–8. doi: 10.1016/j.jse.2013.12.019. 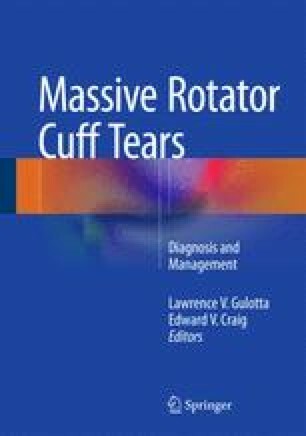 Collin P, Matsumura N, Ladermann A, Denard PJ, Walch G. Relationship between massive chronic rotator cuff tear pattern and loss of active shoulder range of motion. J Shoulder Elbow Surg. 2014;23(8):1195–202. doi: 10.1016/j.jse.2013.11.019.